Sherborne is a market town in northwest Dorset, with a population of around 10,000. It is sited on the River Yeo, on the edge of the Blackmore Vale, 6 miles (9.7 km) east of Yeovil. The A30 road, which connects London to Penzance, runs through the town and a direct service from Sherborne Station to Waterloo connects it to London in just over 2 hours. Sherborne is famous for its historic buildings, including its Abbey church, renowned independent schools, two castles (the ‘old castle’ ruins of a 12th-century fortified palace and the ‘new’ 16th-century Sherborne Castle, built by Sir Walter Raleigh). Much of the old town, including the Abbey and many medieval and Georgian buildings, is built from the distinctive ochre-coloured hamstone. The famous scientist, Alan Turing, went to school at Sherborne School and was voted the nation’s 20th century icon in 2019. Sherborne was made the Capital of Wessex, one of the seven Saxon kingdoms of England, and King Alfred’s elder brothers King Ethelbert and King Ethelbald are buried in Sherborne Abbey. In 705 the diocese was split between Sherborne and Winchester, and King Ine founded an Abbey for St Aldhelm, the first bishop of Sherborne. The Bishop’s seat was moved to Old Sarum in 1075 and the church at Sherborne became a Benedictine Monastery. In the 15th century the church was deliberately burnt down during tensions between the town and the monastery, and was rebuilt between 1425 and 1504, though some of the Norman structure remains. In 1539 the monastery was bought by Sir John Horsey and became a conventional church. In the 12th century Roger de Caen, Bishop of Salisbury and Chancellor of England, built a fortified palace in Sherborne. The palace was destroyed in 1645 by General Fairfax, and the ruins are owned by English Heritage. In 1594 Sir Walter Raleigh built an Elizabethan mansion in the grounds of the old palace, today known as Sherborne Castle. Other notable historic buildings in the town include the Almshouses of Saints John the Baptist and John the Evangelist, founded in 1438 and expanded in the Victorian era in indistinguishable medieval style architecture; the Conduit where regular town markets now take place, the Hospice of St Julian (now the Tapestry Centre) and Sherborne House, famed for its mural by Sir James Thornhill. 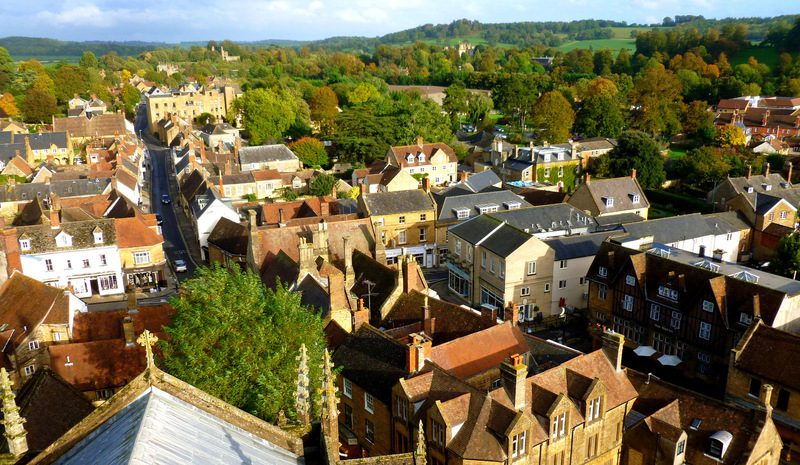 In modern days Sherborne is still a centre of activity for locals and visitors alike. It is well known for its cultural events and festivals as well as its unique high street with a wide range of independent shops offering gifts, fashion, antiques, designer homewares & accessories, craft & sewing, local food, wine and more. To search for all that Sherborne has to offer visit the Sherborne Town website or Discover Sherborne. See our ideas for days out and places to stay while you’re visiting and if you’re looking for local places to eat and drink then have a browse here.